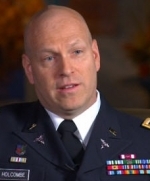 [Lt. Col. Philip Holcombe] I always say the best time to get treatment is now. So whether now is coming back and you have some concerns that you may be experiencing post-traumatic stress disorder well, go in now and talk with somebody. If now is 10 years later, because post-traumatic stress disorder can also have what's called a delayed onset, so it's possible that a person can experience a trauma, seem to be fine, and then years later, something cooks off that traumatic memory, and now they have post-traumatic stress disorder. So the best time to get treatment is always now.